The Bottom Line: A riveting whodunit set against the breathtakingly beautiful and perilous Alaskan landscape. A must for your winter reading list. In a state where 35% of all commuter and air taxi crashes in the U.S occur – claiming the lives of several real-life politicians over past decades – the incident seems hardly unusual. But Jane has little time to grieve, as investigators soon find that the plane was actually destroyed in mid-air. Just who was the target of the bomb placed within the plane’s cabin? The senator and her husband, a corporate raider, seem the most likely marks. But it’s soon clear that each of the plane’s five passengers – and even its pilot – all had enemies. While the official investigation proceeds, Jane has a case of her own to work in parallel. She’s investigating the death of a woman who may have been poisoned by eating local clams, which her assistant was sent to collect on the day of the crash. But the deeper she wades into her own research, the more she suspects that the two cases are in fact intertwined. Jane slowly realizes the undeniable – she herself is in danger. 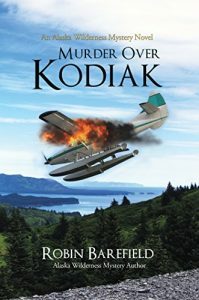 Apart from a superb plot that unfolds with the methodical pacing of the best police procedurals, what distinguishes Murder over Kodiak is how well author Robin L. Barefield renders Alaska itself a living, breathing character. Barefield is a Kodiak resident, where she works as a naturalist and fishing and wildlife-viewing guide. Barefield manages to portray Alaska with a beginner’s eye for detail as she showers each chapter with the state’s singular wildlife, peculiar residents, rugged terrain and inhospitable weather conditions. Each expertly crafted detail adds a layer of isolation, mystery and peril to a mystery that’s well worth spending time with. We book reviewers often talk of ideal “beach reads.” Murder over Kodiak, instead, seems ideal for cozying up with by the fire on a cold winter day.